The ACA cricket stadium in Assam is all set to host one of the seasons most exciting match between Team India and The Windies. The home team led by Virat Kohli is in great form at present. And Windies led by Carlos Brathwaite are no less in terms of giving their opponents a run for their money. As both the teams have great batting strength, a shower of fours and sixes across the stadium is bound to happen and the spectators will have a great cricketing time. So, what are you waiting for? Book your tickets right away. This ticket must be produced by the Holder of the ticket at the time of entry into the stadium. The entry gates will open 2.5 hours before the start of the Match. Entry will be refused if the barcode has been tampered with or if the ticket has been defaced/damaged/tampered with in any way. The ticket should be produced whenever demanded by ACA, BCCI and their representatives. ACA and BCCI reserve the right to search/frisk the holder at any time for security reasons. No item including without limitation like banners or flags etc., displaying commercial logos, which, in ACA`s and BCCI`s view, may conflict with the rights of any official sponsor of the match (`Match`), will be allowed into the stadium. Bottles, Lighters, Cigarette, Tins, Cans, Musical Instrument, Flammable, Toxic, Illegal or Hazardous substances, Metal Containers, Umbrellas, Sharp objects (Such as Knives, Syringes). Cameras, Helmets, Power Banks, Selfie Stick, Wooden Sticks, Backpack, Coins, Firecrackers or Weapons are not allowed inside the stadium. 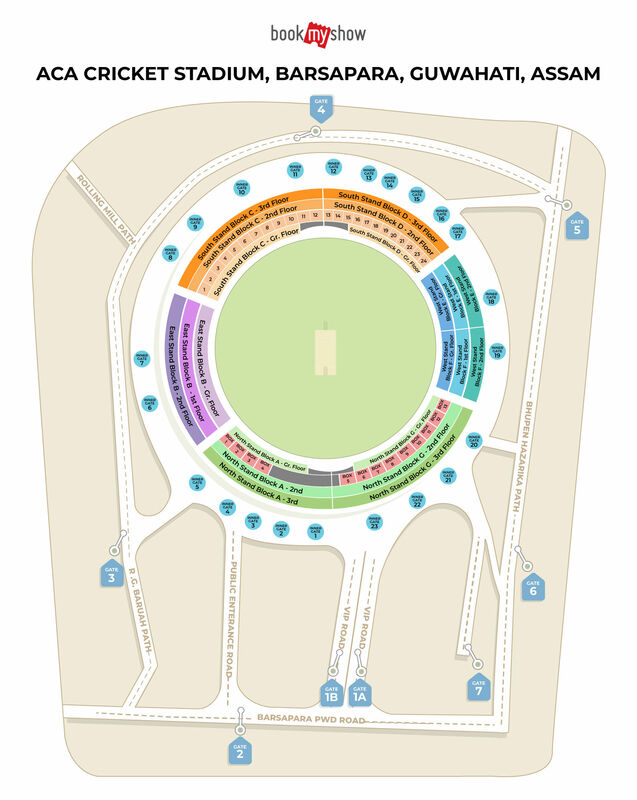 No food or alcoholic beverage may be brought into or taken out of the stadium. ACA and BCCI shall be entitled to seize any prohibited items (as outlined in paras 7, 8 & 9 above) without liability and without any obligation to return such items or to compensate the Holder in respect thereof. This ticket shall not be exchanged, ceded, sold or transferred, whether in a commercial or promotional context (such as, without limitation, as a prize in a lottery or competition or as part of an advertising or promotional campaign), with or without consideration, unless written permission has been previously obtained from ACA and BCCI. The use of mobile phones, transistors, computers, cameras or any other audio visual recording equipment, for recording and/or communication of Match details, statistics, images etc. is strictly prohibited. The Holder acknowledges and consents to the recording of his/her likeness and/or voice and that BCCI is entitled to use and sub-license all rights in respect of such recordings. The Holder will not sell or offer for sale any product or service from any part of the Stadium. ACA and BCCI will not be liable to the Holder whether in contract, tort or otherwise for any indirect, incidental, special or consequential loss or damage or for any loss of profit or revenue, loss of use, loss of business or contracts or loss of opportunity. The Holder shall not engage in any form of `Ambush Marketing` and shall not conduct in any activity that conflicts with or infringes the rights of any official sponsor or commercial partner. Entry onto the field of play at any time and the throwing of any article is strictly prohibited. Refunds will only be made if the match is canceled without a single ball being bowled. No other refunds will be made. There is no obligation on ACA and BCCI to reschedule the match. Spectators are reminded that any of the language or behavior referred to in paragraph 18 above or any action in breach of paragraph 19 will result in ejection from the ground and possible further action such as criminal prosecution, identification by way of photographing and/or capturing by video camera of the images of such persons and life-bans being imposed on such persons. ACA and BCCI will not subject to any limitation imposed by law be in any way liable to the Holder for any event, occurrences, or other timing the cause of which is beyond the reasonable control of ACA and BCCI. In addition to these conditions, the entry shall be subject to any ground regulations specific to the stadium. Entry into the stadium constitutes the agreement by the Holder to be bound by these terms and conditions and by any stadium regulations which may be displayed at the stadium together with all present and future laws, rules and regulations whilst within the stadium. 2 years and above children required a valid ticket. ACA and BCCI reserve the right, without refund or other recourse, to refuse admission to anyone who is found to be in breach of these terms and conditions including, if necessary, ejecting the holder/s of the ticket from the stadium after they have entered the ground.